Okay, with major help from Eve (and from somebody else who suggested using a stitch marker – thank you! ), I finally finished my Basic Birds. I had to redo the first one I made about five times, but the second one went much more smoothly. I am still in shock that I made something round…it makes me feel that I could go on and tackle bigger things! My husband named the one on the right Hector. We’re not sure what the pink one’s name is. 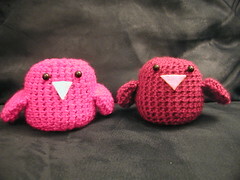 **One question for those who made Basic Bird — I haven’t attached the felt beaks yet. How did you attach them? Thanks! AAwww they are so cute! I can’t believe you made 2, great job. Thanks! The second one was totally easy. It was the first one that took me forever! I haven’t made any of the birds yet, but I would think you could use embroidery thread and a running stitch to attach them. Either that, or dab a little glue on it to make it stick. I agree with carolinagirl… a bit of hot glue, or a quick stitch. I’d go for the glue, myself, if it’s not something a small child will play with…otherwise, stitch for sure. Holli-Jo don’t forget to sign up for the FLICKR group and add you picture to the pool. Okay, I’m going to go the easy way and glue the beaks on! Thanks for the advice, guys. I love them!! so cute. They would look so cute in a wee nest!